I can't very well mention last year's New Year's album and not point out that the 2016/2017 album is also out. It's called "Come At Me Slow" and you can listen below, on SoundCloud, or on Spotify. The standouts for me this year are the amazing cover art by Kathleen and the epic sounds of the title track. It is with some regret that I note that I still haven't been awarded the steam achievement described by "Hate Plus / Love Note", despite sending a verification photo and e'rything. With the crush of the SIGGRAPH deadline, I failed to both create a New Year's card or even make a post detailing the Jimike New Year's album for 2015/2016. So let's fix that right now, shall we? My remedial New Year's card for last year is titled "Grid Line", and that about sums it up. The grid gets interesting half-way through. Play here (works on smartphones, too!). 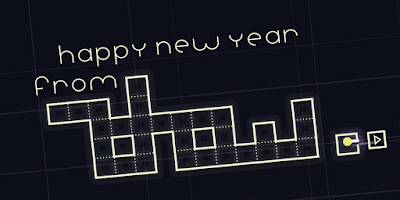 I think this might also be my first New Year's card with sound effects (though those don't work on phones; sorry). Standout tracks for me are "Dear Snails" and "The Only Fi I Have" both of which have honest, if shallow, lyrics.